If you read our last blog, then you have an awareness and working knowledge of what Akoya Pearls are and where they come from. In this blog we are going to explore a bit more in-depth the gorgeous shapes that Akoya Pearls come in. Many people assume that only high quality pearls are perfectly round. This thought process could not be further from the truth. Another common misconception is that pearls that are irregular in shape are “natural pearls”. Pearls are a naturally formed gem, because the process is not entirely controlled by human hands, gorgeous shapes evolve. Pearls that are not perfectly round are not considered natural pearls. In fact, if anyone tries to sell you a “natural pearl” it would serve you well to run. In today’s pearl market, 99.9% of all pearls are cultured pearls. Meaning that they are farmed and harvested. There are many laws forbidding the hunting of wild oysters for their pearls. As a result, they are nearly impossible to find, and if you did “find one” a red flag should be waving. All pearls, like their gorgeous rainbow of colors come in a variety of shapes. The most well-known are pearls are perfectly round, then near round, baroque, tear-drop and button. When selecting a shape of pearl, there is no right or wrong shape to choose. It is based entirely upon preference and personal style. 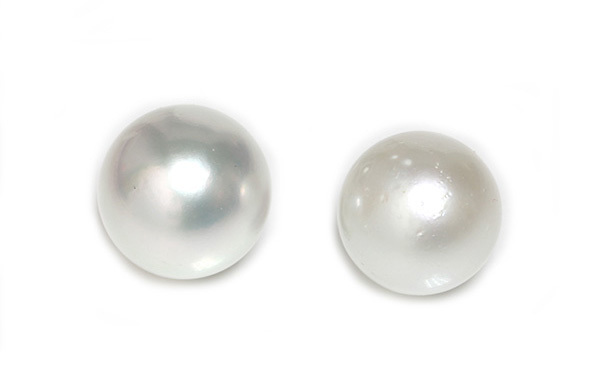 Here is a great example of how shapes for Akoya Pearls can vary slightly. While to the layman’s eye, both of these pearls could easily be considered to be round. But in order for a pearl to be classified as round, it must be perfectly round. If you look closely, the pearl on the right is not perfectly round. This shape is called “near round”. Because Akoya Pearls are smaller in overall size than South Sea or Tahitian Pearls, the shapes they come in are not nearly as exaggerated. Teardrop and button shaped pearls are common in the larger sizes of pearls (South Sea and Tahitians). Because of its smaller shape, Akoya Pearls are not typically given the classification of button or teardrop shape. For example, South Sea Pearls can grow as large as 27mm (granted this would be quite rare). But because of its size, a baroque South Sea Pearl would be more irregular in shape than a baroque Akoya Pearl. Here is a great example of what would be considered a baroque Akoya Pearl and a baroque South Sea Pearl. You can see how the difference in size impacts the irregular shape of these beautiful pearls. If you are considering an Akoya Pearl Necklace, we invite you to explore our website which has hundreds of gorgeous Akoya Pearl Strands. Each necklace has been individually photographed and graded. The piece that you are viewing is the actual piece that you will receive. If you live in the Los Angeles area, we would love to have you visit our showroom. We are open to the public and you never need an appointment. Our passion is pearls, and we look forward to sharing this passion with you. Even if you love pearls but know very little about them, you have probably noticed that there are many different types, sizes and colors of pearls. In this blog, we are going to discuss one of the three main types of pearls: Akoya Pearls. Saltwater pearls come in three main varieties: Akoya Pearls, Tahitian Pearls and South Sea Pearls. 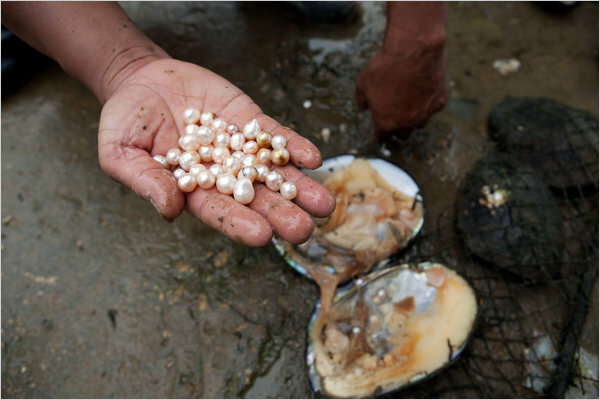 Pearls are classified by the region they are harvested from. For example, Akoya Pearls come primarily from the warm coastal waters of Japan. For each type of pearl, a different type of oyster is responsible for its development. The Pinctada Fucata oyster is the oyster that produces Akoya Pearls. This oyster only survives in the waters near Japan. As a result, Akoya Pearls could never be harvested in the French Polynesia (where Tahitian Pearls are from) or near Australia, Indonesia or the Philippines (where South Sea Pearls are from). Therefore, when you see a specific type of pearl or hear its name, you know exactly what region in the world it is from. Akoya Pearls are the most common type of pearl. Chances are if you have seen a beautiful strand of pearls, they are most likely Akoya Pearls. 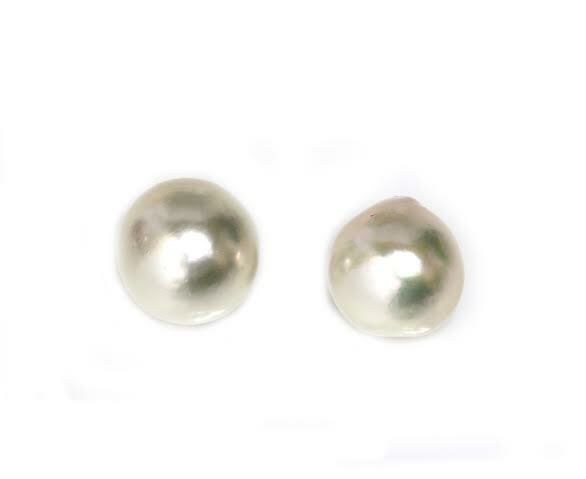 For decades, these little gems have been the main staple of women’s pearl jewelry. One of the beautiful things about the world of pearls is the beautiful variety of colors that they come in. Akoya Pearls come in shades ranging from pure white, to ivory, to silver; soft pink and rarer shades include blue, pistachio and champagne. Akoya Pearls can also be found in dark green and black tones. 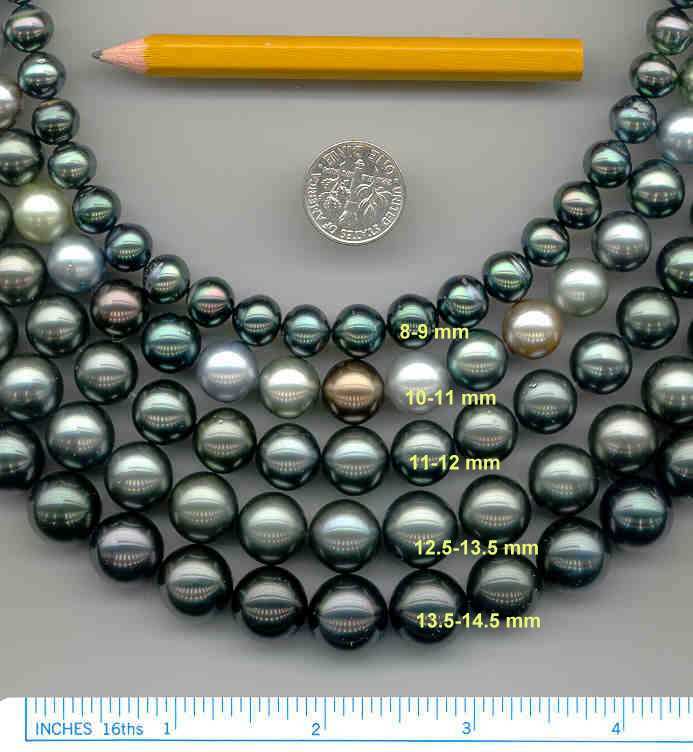 These darker colors are not natural colors for Akoya Pearls and have been chemically enhanced. One of the unique aspects of pearl colors is the gorgeous overtones that they have. For example, an Akoya Pearl can be white but have a silver overtone. Or, a silver Akoya Pearl can have a green overtone – you can imagine how incredible the combination of these colors and overtones can be! Of the three types of pearls (Akoya Pearls, South Sea Pearls and Tahitian Pearls), Akoya Pearls are the smallest in size. Akoya Pearls range in size from 2mm all the way to 10mm. The most common size of Akoya Pearl is 7mm. In our next blog we are going to explore more in-depth the gorgeous shapes of Akoya Pearls. Check back soon! If you have either bought a strand of pearls or done any amount of research on pearls, then most likely, the term nacre has probably come up. And, if you are like most, you just know that the nacre is important – but are not really sure why. In this blog we are going to illuminate why nacre is so important, how it develops, and why it is factored into the overall grade. Nacre is the outer coating of a pearl. When an oyster is nucleated, the nucleus is irritating to the shell. In order to protect itself from this irritant, the oyster secretes nacre around the nucleus to protect itself from the foreign object. Nacre is also referred to as ‘Mother of Pearl’ and is the same gorgeous and shimmery material that lines the interior of a mollusk. Nacre is deposited in the thinnest of coatings as the pearl is developing. The layers are actually quite similar to the layers of an onion. Pearls with a short harvest time, tend to have a more thin nacre. Pearls that are allowed longer to cultivate have more layers and therefore a more thick nacre. Pearls that have a thin nacre may appear beautiful at the time, but as they age, the nacre will wear off thus ultimately removing the luster of the pearl. When this happens, the pearl has a dull and chalky appearance. As a result, pearls that have a higher quality nacre are more valuable and will last significantly longer and maintain their luster in contrast to pearls with a thin nacre. As we discussed earlier, freshwater pearls are made up entirely of nacre, whereas saltwater pearls have a nucleus with the nacre forming around the nucleus. As a result, the thickness of the nacre is an attribute that applies only to saltwater pearls. At Seven Seas Pearls, all pearls are rated individually and then each rating is averaged out for a total grade. The rating that Seven Seas Pearls’ uses for the absolute best nacre is “top” from there the nacre is rated Very Thick, Top, Medium and Thin. 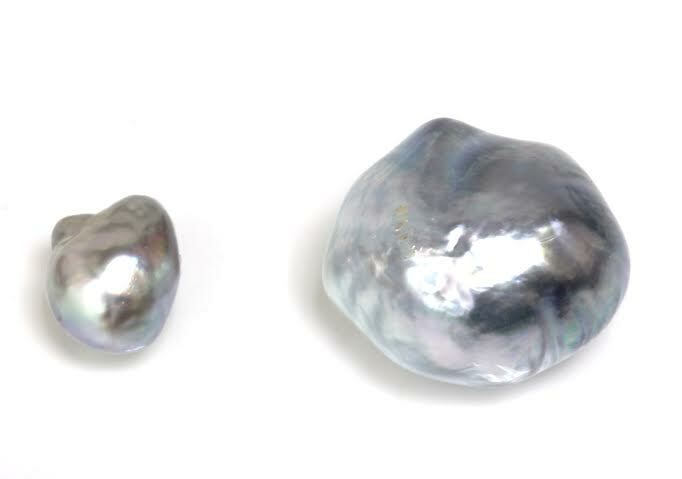 Here is an example of the difference between a pearl with top rated nacre and thin nacre – can you see how the nacre dramatically impacts the luster and glow? 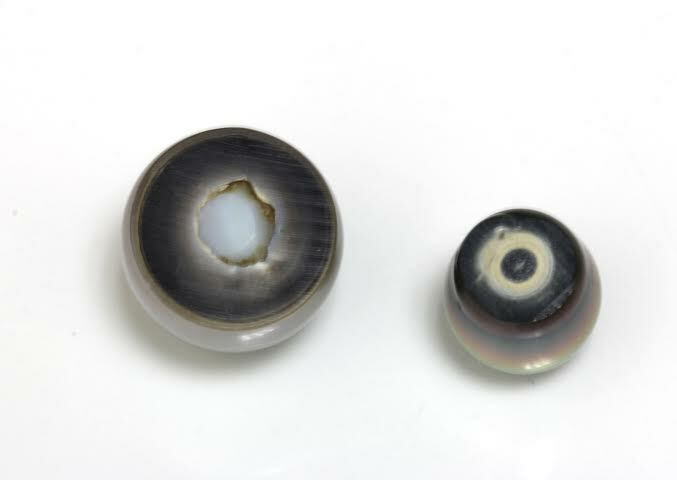 Here is another example of nacre with a less extreme difference between the grades. 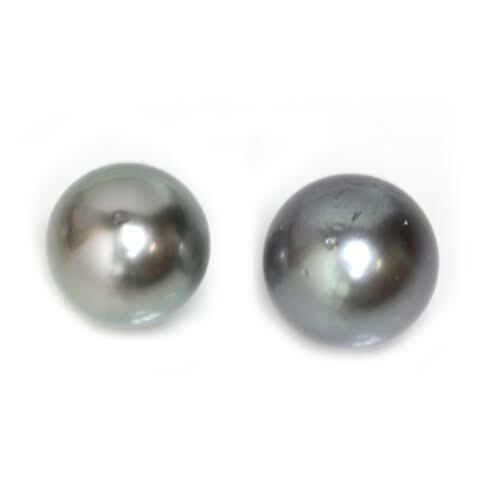 The pearl on the left has a rating of very thick nacre and the pearl on the right has a rating of medium nacre. As you can see from the above images, the thickness of the pearl nacre has a dramatic impact on the overall quality, luster and beauty of a pearl. Check back soon for our next blog on Akoya Pearls! When considering a piece of jewelry (pearl, gemstone or diamond) the term “clarity” comes up rather frequently. In past blogs we have explored how pearls are graded and how Seven Seas Pearls grades pearls in contrast to the pearl industry. Surface clarity is a term that is used frequently to describe the overall quality of a pearl – here in this blog we are going to explore in depth why the surface clarity of a pearl is such an important factor to consider when making a pearl jewelry purchase. The obvious first question is “what is surface clarity” – surface clarity, much like its name implies is how smooth or without flaws the surface of a pearl is. Since pearls are formed by the insertion of a nucleus, the nacre develops around it and results in layers being built around the nucleus. Since the process of nacre layers developing is a naturally occurring process (without human intervention) there is no way to guarantee the quality of the surface clarity. The surface of a pearl can be incredibly smooth – without indentations or flaws or it can be incredibly flawed and have many dents. As we mentioned in a previous blog, like when buying a diamond, it is important to have a balance of all the aspects of how a pearl is graded. If you have a pearl with excellent luster – but poor surface clarity, the pearl will have a dingy appearance. The same would be true with a pearl that had excellent clarity, but poor luster. This is one of the reasons why Seven Seas Pearls grade pearls on each individual aspect and then those ratings are averaged out for an overall grade. As you are probably very familiar with by now, pearls are graded universally on the AAA grading system. Seven Seas Pearls has added an extra category that describes pearls that have perfect clarity. For perfect surface clarity, this term is AAA Flawless. Here is an excellent example of how important surface clarity is. 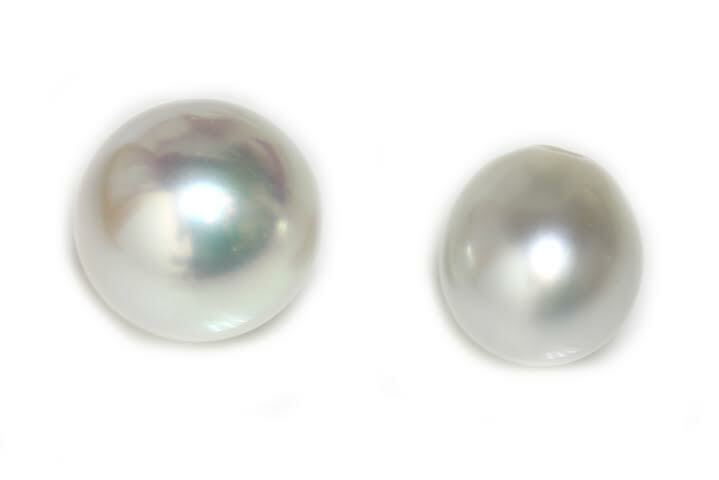 Here are two pearls that have the same rating of luster – but as you can see, one has very poor surface clarity (rated A+) and the other has very good surface clarity (AAA Flawless). As always, extreme differences are easy to see and take notice of. 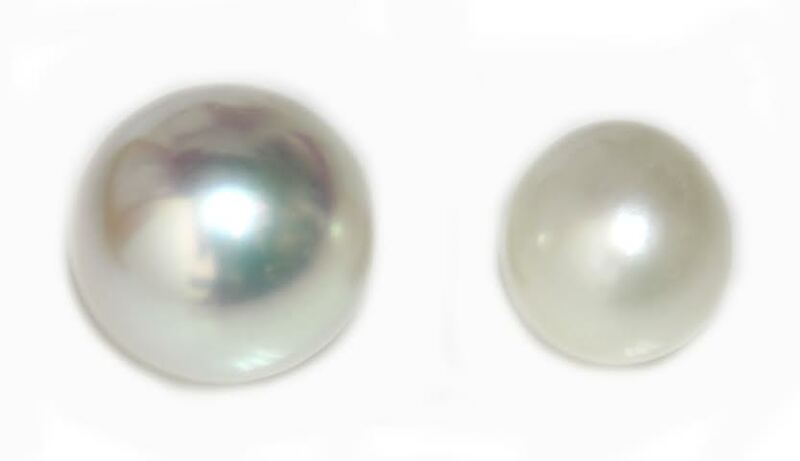 Here is an example of two pearls that are a little closer on the rating scale – even still, it is easy to see the difference in surface clarity and ultimately why they are graded differently. 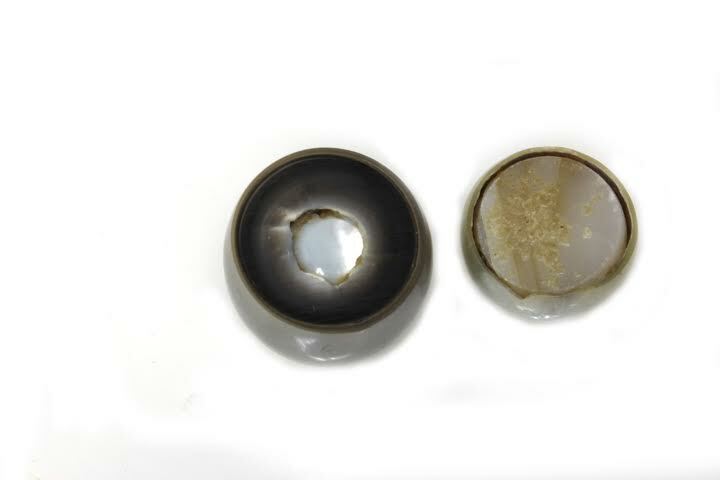 The pearl on the left has a surface clarity rating of AAA and the one on the right has a rating of AA – can you see the difference? As you can see, pearls with a higher quality surface clarity allow the pearl’s luster to really glow and reflect the light. As a result, pearls with a high surface quality are more valuable and desirable than pearls with a lower grade. The next aspect of pearls that we are going to explore is nacre and why it is so important. Check back soon for our next blog. Why is luster so important for pearls? If you have been reading our blog, then you have heard us use the term “Luster” – while you can probably guess just from the name what this refers to, in this blog we are going to give you a more in depth understanding as to just what luster is and why it is such an important consideration when purchasing a piece of pearl jewelry. The obvious question is “what is luster”. When you hear “luster” it makes it easier to think of it as the amount of light or glow to a particular pearl or strand of pearls. Light is reflected off of a surface, the luster of a pearl refers to how much light as well as the quality of light that is reflected from the pearl. Pearls can have excellent to very pool luster. 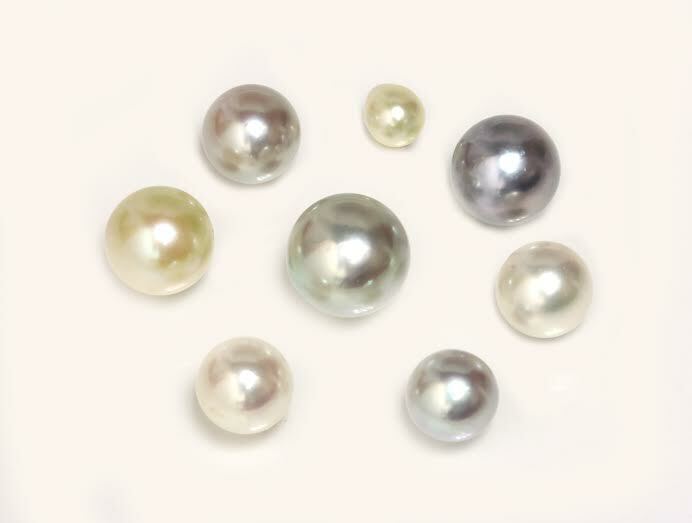 Pearls with very pool luster appear dull and have almost a chalky plastic appearance. In contrast, pearls with excellent luster will glow and shine. The luster has a dramatic impact on the overall price of a pearl, the reason being that not many women would be impressed with a string of pearls that had the same amount of glow as a bunch of small rocks. Here is an excellent example of a pearl with excellent and very poor luster – it’s pretty easy to tell the difference isn’t it? That was an example of two extremes – one pearl with perfect luster – and a pearl with absolutely terrible luster. Naturally there are grade variations in between these two examples. If you remember from previous blogs, one thing that we have highlighted many times is how Seven Seas Pearls’ grading system is different than any other pearl grading system. Ultimately, Seven Seas Pearls grades each pearl on their individual criteria: luster, surface clarity and nacre. Others just give the pearl an overall average grade. With our system, it is easy to see exactly the quality of luster you are receiving. The universal grading system for pearls is the AAA grading system. At Seven Seas Pearls, we have added an extra category for pears with perfect luster. These pearls are given a rating of AAA Gem. The rating scale goes from AAA Gem, AAA, AA+, AA, A+ to A ratings. A pearl with the rating of “A” will have very pool luster. 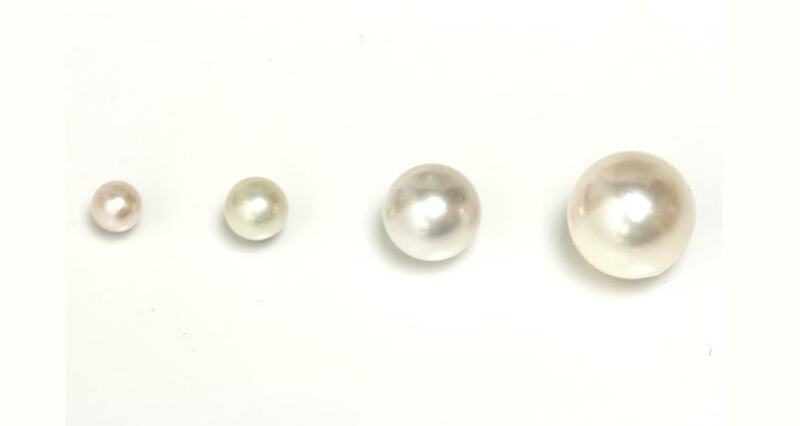 Here are a few examples so that you can see for yourself the difference of pearls with various luster ratings. For example, here is a pearl with AAA Gem rating (very high) and an AA rating (not so high). Can you see the difference between the glow of the pearl on the left and the pearl on the right? As you can see from these above examples, the luster of a pearl makes a huge difference on their overall appearance and beauty. It is easy to see why pearls with a higher grade luster are more valuable than pearls that have poor luster. Check back soon for our next blog on surface clarity and why it is so important. Welcome to the Seven Seas Pearls blog! My name is Julie and I will be the primary author of this blog. Personally, I am thrilled to be the writer for this blog because I have a deep love of pearls. To me, no piece of jewelry can compare with the classic elegance that pearls convey. One of the things that we pride ourselves on at Seven Seas Pearls is that we believe it is crucial that our clients not only get a tremendous value for their money, but that they are also educated on what they are buying. For this reason, we have decided to start this blog in hopes of educating all lovers of pearls on how to identify high grade pearls from others, about the differences in shapes, colors, sizes – and most importantly how all this impacts the ultimate value of the pearl. But before we get into the nitty gritty details of pearls, it is probably more appropriate to explain a little bit more about who we are and the journey that has led us to where we are today. Seven Seas Pearls is a third generation pearl jewelry company that has been specializing in various types of high quality pearls since 1946. While our main showroom is in Los Angeles, California, we have five locations around the world to include: Japan, Tahiti, Canada and Germany. One of the things that set us apart from other pearl jewelry stores is that not only are we a direct importer of the pearls that we showcase, but we directly export the pearls from various sources as well. Our office in Japan is located in Ise, which is considered to be the very heart of the pearl growing area of Japan. As a result, we interact directly with the pearl farmers on a daily basis. Our office in Tahiti as one might guess, exports the beautiful Tahitian pearls that everyone is so familiar with. For us, the process of buying and pearls is one that has transcended through the generations with many of the same pearl farmers, their children and their grandchildren. In order to insure quality control, we personally sort, grade and drill each pearl. Because of this, we are able to offer our clients great flexibility in designing the perfect piece of pearl jewelry. We are proud to offer everything from South Sea pearls, to Tahitian black pearls and Japanese Akoya pearls. Just like our wide range of colors, we have an incredibly selection of pearl sizes – ranging from 27.00mm to under 1mm. We invite you to check back for updated blogs, tour our website and stop in and meet us personally.